Whether you are growing flowers, herbs, vegetables, a lawn, or a shrub border, healthy soil is an absolute must. Your plants will be less prone to pest and disease issues, they'll grow better, and they'll look better. With a bit of know-how, some work, and some patience, you can have healthy soil, no matter what kind of soil you are starting with. You often hear gardeners talk about their soil's "crumb." This refers to the texture of the soil. Good soil is crumbly, like cookie crumbs scattered over the top of an ice cream sundae. That crumbly texture takes work, and we'll talk more about that in a minute. Organic matter is just dead plant and animal tissue, which decomposes and enriches your soil as humus. Humus is wonderful because it helps improve your soil's texture by binding some of the smaller particles together, which increases your soil's aeration. It also improves your soil's ability to both absorb and drain moisture. Finally, organic matter helps provide nutrients to your plants. Microorganisms help break down the organic matter into its basic elements, which enables plants to absorb it and use it. Soil pH is the measurement of the acidity of your soil. This affects the minerals contained in garden soil and their availability to your plants. In general, the closer to neutral your soil is, the better your plants will be able to take up these minerals. Of course, some plants prefer a more acidic soil, but for most flowers, herbs, and vegetables, a more neutral pH is optimal. Clay soil: Clay has tiny particles that stick together, forming large clumps. While clay soil tends to be of higher fertility than other soil types, it is not optimal to garden in because its texture makes it very difficult for plant roots to work their way into it. Improving clay soil takes some work, but it will make life much easier for your plants. Sandy soil: Sandy soil is definitely easier to work than clay soil -- but it has the opposite problems: it often drains too quickly and is less able to retain nutrients. Loam: This is an ideal garden soil. Crumbly, full of organic matter, retains moisture yet still drains well. This is what we're working toward; this is "good" garden soil. There are several things you can do to improve your soil. Luckily, they are actually all fairly easy to do. The first thing to do is learn all you can about your soil. You may want to try a couple of DIY soil tests to learn more about the level of life in your soil and what its texture is like. Getting a soil test from your county's cooperative extension would be a great idea; this will alert you to any deficiencies or pH problems. Adding organic matter is hands-down, without a doubt, the number one way to improve your soil. Whether your soil is clayey, sandy, low in nutrients, compacted, has poor drainage....organic matter will fix it. So what should you be adding to your soil? 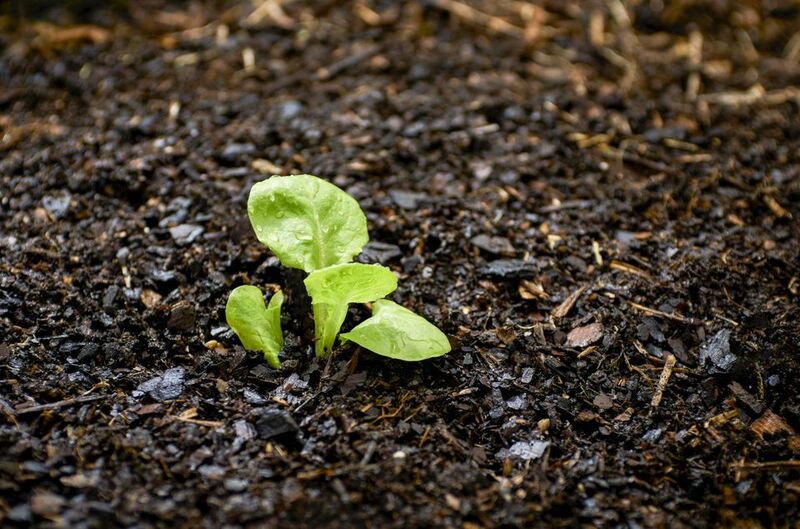 Compost is a must -- it will improve your soil immediately and introduce microorganisms that will continue improving your soil by further breaking down organic matter. Add as much as you possibly can; it really is nearly impossible to overdo it with compost. Add some in spring before planting. Side-dress your plants with it throughout the growing season, and add more in fall when you are putting the garden to bed -- you will see improvement in no time. In addition to compost, there are several other things you can add to your soil to increase the amount of organic matter (and therefore overall fertility.) Grass clippings, shredded autumn leaves, aged manure, coffee grounds -- all of it will help your garden's soil increase in fertility, water retention, and improved texture. Once you have your soil tested, you'll know whether you have a pH imbalance. If your soil is acidic, there are several things you can do to reduce the acidity level. Generally, the report you receive from your extension service will have recommendations for improving the pH of your soil. The addition of plenty of organic matter will often help this as well. As a garden guru, Barbara Damrosch points out, if you have soil that is well supplied with nutrients and organic matter, the pH matters less than if your soil is struggling with those issues. One reason so many gardeners like raised beds is because it eliminates one of the main causes of soil compaction: people stepping in the garden beds! Continually stepping or pulling wheelbarrows over a garden bed compacts the soil, making it more difficult for plant roots to grow. Avoid stepping on garden beds as much as possible. No-dig or no-till gardening is becoming more popular, partially because it reduces the amount of work the gardener has to do, but also because we understand more about the soil food web. The more we disrupt the soil, the more we disrupt the ecosystem in our soil. That ecosystem is what makes healthy, crumbly, nutrient-rich soil possible. Till and dig as little as possible. Add organic matter to the top inch or two of soil, or just lay it right on top of your garden and let the earthworms work it in for you. With these tips, you will see a vast improvement in the quality of your soil, and, therefore, in the health and beauty of your plants. It will take a little time, but your patience will be well rewarded.